One of my favorite events at the BlogHer conference last month was Listen to Your Mother, an open mic style show where bloggers threw their names in a bowl for the chance to read their favorite blog posts. Out loud. In front of people. Many, many people whom they had never met. Brave little bloggers, they were. It was a blast for me as an audience member, not only hearing some great writing, but getting a tiny glimpse into the bloggers themselves. They had to pick one post from the whole of their blog and say this is the one I want to share with everyone. Not necessarily their most popular post or most influential post (although some of them probably were). But the one that meant something to them and that they felt represented them. Some were hilarious, some were poignant. They all made me feel like I learned something about the people reading them. As a bonus, I discovered some new blogs to read. I thought it could be fun to do an open mic style roundtable. Our group is growing and a lot of us haven't "met" each other yet. So point us to a favorite post on your blog. It doesn't even need to be about adoption. And tell us a little bit about why you picked the one you did. Write a response at your blog--linking back here so your readers can browse other participating blogs--and link to your post in the comments here. Hotel Rwanda and Open Adoption Parenting: "Because in parenting, extraordinary can also mean extra + ordinary." I'm Just as Scared of You as You are of Me: "The reason this one is here is that 7 months down the line I can still learn from this post. I, having written it myself, so nothing I say in it should be that surprising, and yet it is." Sister, Sister: "I think it truly tells the story of our adoption and what an open adoption can be." 'Tis that Time of the Year: "This is my entry. I like this one because it is filled with so much hope. Shortly after this we flew out and found that the mother changed her mind. Yet, each time I read it, it reminds me how hopeful I was." Our First Pink Purchase for 'Our Baby': "Because it is the fun part of our adoption journey!" Come Monday, It'll Be Alright: "Because I still can't believe how we went from feeling so low, to finally becoming parents!" Dealing With Online Negativity in Adoption: "I loved writing this post about how I deal with online negativity in adoption--specifically when negative things are written about my family. It was healing to see how far I have come and put into words a very specific thought process. This post cuts to my core." Let's Talk About Trans Racial Adoption: "This is one of my most personal posts that I have written. " My Sister Lives in Texas: "This is one of my favorite posts because is focuses on the impact of loss and adoption on my daughter. She is the reason we keep hoping and moving forward. She 'gets' open adoption and has such a deep understanding of unconditional love even at her young age. " Open Adoption Roundtable guest Post: "Mine is actually my last open adoption roundtable post written as a guest post by our son's birthmom. What Not to Say: Part III: "I have done What Not To Say posts for quite a while on our adoption & infertility blog and I am always amazed by the women they 'speak' to. This is our most recent one but there are links to the others' as well.... Enjoy!" This is Perfect for When I Can't Sleep (note: music plays automatically): "I just recently started a blog about my open adoption journey. I am a birthmother as of this May 22, 2011. I only have about 5 posts to pick from! I guess this is my favorite so far." Let's Get "Real"! : "'How will you feel when your daughter knows who her "real" mom is?' Well, let me tell you..."
Love Is Not a Pie: "This was one of the first blog posts I ever wrote. I didn't even have my own blog yet; I posted it originally on BlogHer. When I did set up my own blog, I ended up using the title of this post as the title of the whole blog. It's still a favorite post of mine because it sums up so much about my philosophy ... about open adoption and life." Adversity is like a strong wind: My blog since adopting only has a few posts so not much to choose from yet, but so far my fave would be Adversity is like a strong wind..."
In Which I Throw My Daughter to the Wolves: "My favorite post on my blog isn't about adoption, it's about the ridiculous women-can't-win expectations of our culture." I am Changing, Less and Less Asleep: "My favorite post is when I finally kind of came to terms with my entire story up until that point. This was before we even knew we would be adopting. Just trying to get through life day by day. " Today's Adoption Update: "I share this post because I think it captures the uncertainty, the elasticity of expectations, and the loss that often come with all the good that adoption brings." A and I Get Kicked Out of J. Crew: "Not so much adoption related, but I really enjoyed writing this post." Going Toe-to-Toe with Pregnant Relatives: " My previous and current adoption journey have both coincided with a pregnant sister. I recently wrote about my feelings on this - the pain of infertility and being excited to adopt at the same time. This topic has touched a lot of people - I have gotten a lot of comments from strangers thanking me for talking about it." Evolving Opinions on Open Adoption: "When we first adopted Zoe from Vietnam, birth parents were scary to us. What we have finally realized in the past few years is that adoption is not about US and what WE are comfortable with. Adoption is about our CHILDREN and what is best for THEM. We now believe that what is best for THEM is to have contact with their birthfamilies, or at least that they have the OPTION to have contact with their birthfamilies." An Open Letter Regarding Abandonment: "I wrote this blog post recently in dealing with someone who didn't understand the process that goes into making a decision to become a birthparent." Rant: "This one's my current favorite because it speaks to something that I've been dealing with a lot lately - adoption hatred from specific birth mothers who have had bad experiences trying to taint adoption as a whole." Quilting Hope...Baby Blanket Style: "This post is about making a baby quilt ... a huge leap of faith for me during the wait." My Wish For You:"This should have been an easy one...just go through and find my favorite post. Whoa, time, life, and all of that kind of got in the way. I stumbled upon this post written while we were waiting for our second child. It reminded me so much of where we were, how far we have come, and how much further we have to go. Open adoption is an ever evolving process and I hope anyone involved in any situation continues to have hope and never gives up when things are not going as they thought they should be. This post made me cry--I'm sure there's another one I love more, but this was the start of my foundation. " The Woman Upstairs: "There are many reasons why that post is my favorite, so I can’t narrow it down to just one. It remains my best piece of writing about the memories of my pregnancy, as I shut them down and push them aside so often. I let myself 'go there' for this particular post and the result was something that I was intensely proud of, though completely drained after writing it." I Now Hate To Look at My Referral Pictures: "While my adoption wouldn't be a traditional open-adoption and my blog is not an adoption blog I am posting a favorite post of mine from when I blogged for adoption.com." I See Her: "I chose this post because although it doesn't get into adoption all that deeply, it does summarize my feelings about it...my feelings about my little girl." Moving On...? : "Here is the second post I ever wrote. I love it because I think it shows both the immediate pain after placement and the healing that occured after our first visit. I wanted to write about moving on because I dont know that it is truly possible for any birth mom." Mother's Milk: "This is the post I wrote - AGES ago- when I finally let go of caring that my babies weren't breastfed." All About the Wait: "I chose this post because it's a summary of how I felt during our wait for a match and how I felt after bringing our baby home." May 14, 2007 Placement (note: music plays automatically): "Because even I still need a reminder of why adoption is so emotional." Getting To Know You: "I felt free to talk about my fears. I think one of the reasons I'm often defensive and sensitive to adoption questions is because at times they get to my own fears as adoption for us is a complete unknown. I've heard parents say 'I wish my baby came with a manual' however at least they knew the approximate date of their babies arrival, and developed personality traits based on their babies activity in the womb. How much of that is projected onto the baby who knows but I'm terrified the baby is going to be placed in my arms and its not going to feel 'right.'" Four Things: "It reminds me how much had changed in my perspective on adoption during the three years between walking into Adoption Agency #1's information meeting and the writing of that post--due in no small part to the stories and people I had found online." Because in parenting, extraordinary can also mean extra + ordinary. I think it truly tells the story of our adoption and what an open adoption can be. This is my entry. I like this one because it is filled with so much hope. Shortly after this we flew out and found that the mother changed her mind. Yet, each time I read it, it reminds me how hopeful I was. My favorite post is http://makingourfamilycomplete.blogspot.com/2010/02/our-first-pink-purchase-for-our-baby.html because it is the fun part of our adoption journey! Because I still can't believe how we went from feeling so low, to finally becoming parents! I loved writing this post about how I deal with online negativity in adoption--specifically when negative things are written about my family. It was healing to see how far I have come and put into words a very specific thought process. This post cuts to my core. This is one of my most personal posts that I have written. This is one of my favorite posts because is focuses on the impact of loss and adoption on my daughter. She is the reason we keep hoping and moving forward. She "gets" open adoption and has such a deep understanding of unconditional love even at her young age. 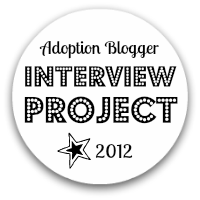 Mine is actually my last open adoption roundtable post written as a guest post by our son's birthmom. It's still the most popular post on my blog. I have done What Not To Say posts for quite a while on our adoption & infertility blog and I am always amazed by the women they 'speak' to. This is our most recent one but there are links to the others' as well.... Enjoy! Grateful for this open adoption community! Thanks for checking out my blog :). "How will yo feel when your daughter knows who her "real" mom is?" 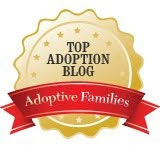 Here is one of my favorites: "Living in a Glass House-Being Open in Our Open Adoption Journey"
This was one of the first blog posts I ever wrote. 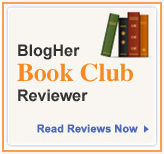 I didn't even have my own blog yet; I posted it originally on BlogHer. When I did set up my own blog, I ended up using the title of this post as the title of the whole blog. It's still a favorite post of mine because it sums up so much about my philosophy ... about open adoption and life. My favorite post on my blog isn't about adoption, it's about the ridiculous women-can't-win expectations of our culture. my favorite post is when i finally kind of came to terms with my entire story up until that point. this was before we even knew we would be adopting. just trying to get through life day by day. My previous and current adoption journey have both coincided with a pregnant sister. I recently wrote about my feelings on this - the pain of infertility and being excited to adopt at the same time. This topic has touched a lot of people - I have gotten a lot of comments from strangers thanking me for talking about it. It's called "Going Toe-to-Toe with Pregnant Relatives." When we first adopted Zoe from Vietnam, birth parents were scary to us. What we have finally realized in the past few years is that adoption is not about US and what WE are comfortable with. Adoption is about our CHILDREN and what is best for THEM. We now believe that what is best for THEM is to have contact with their birthfamilies, or at least that they have the OPTION to have contact with their birthfamilies. I wrote this blog post recently in dealing with someone who didn't understand the process that goes into making a decision to become a birthparent. This one's my current favorite because it speaks to something that I've been dealing with a lot lately - adoption hatred from specific birth mothers who have had bad experiences trying to taint adoption as a whole. Whew. Finally got this done. Thumbs up for the "easy" content this time. My brain is foggy with ick. I hope to be able to jump through others' posts sometime soon. Now back to bed! Here is the second post I ever wrote. I love it because I think it shows both the immediate pain after placement and the healing that occured after our first visit. I wanted to write about moving on because I dont know that it is truly possible for any birth mom. This is the post I wrote - AGES ago- when I finally let go of caring that my babies weren't breastfed. It's taken me a long time to get myself to sit down and go through my posts. Hopefully, I'm not too late! I chose this post because it's a summary of how I felt during our wait for a match and how I felt after bringing our baby home. Thanks again for being the hostess with the most-ess. I look forward to reading all of the other roundtable submissions! because even I still need a reminder of why adoption is so emotional. I felt free to talk about my fears. I think one of the reasons I'm often defensive and sensitive to adoption questions is because at times they get to my own fears as adoption for us is a complete unknown. I've heard parents say "I wish my baby came with a manual" however at least they knew the approximate date of their babies arrival, and developed personality traits based on their babies activity in the womb. How much of that is projected onto the baby who knows but I'm terrified the baby is going to be placed in my arms and its not going to feel "right."